I just ordered this set and am SO excited and can not wait to get it. I am not really much of a fan of the makeup but OMG am I excited to get the clutch! So I guess I should start by explaining what this set is. Perfect for date-night and beyond, this assortment of products and stylish woven bag with chain detailing makes the ideal gift for the glamour girl with an edge. Jewel Eye Shadow in Black Diamond offers a highly pigmented black with silver pearl wash of color for the lids. Pair the shadow with Sparkle Waterproof Liquid Eye Liner in Spectrum, a glittery, pigment-rich black eyeliner with a rainbow multi-pearl finish that stays put all day and night. Finish off the look with Stila's Lip Glaze in Apricot, a high-shine lip gloss with a delectable matching flavor and scent, dispensed in Stila's iconic click pen. 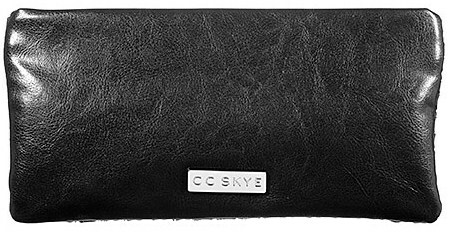 Now what is the CC Skye Benetar clutch? I have been lemming it ever since I saw Ashley Tisdale carrying it! I do not quite no why it called my name so much. I am not an Ashley Tisdale fan (I can not even tell you who she is or what she is in other than the fact that I saw this image online and fell for the bag!) and I am not such a gold fan. The bag retails for $150 and it went on sale awhile back somewhere for $110 and I almost got it. But decided that I could not justify it since it has gold hardware and I am not a big gold fan. Now the best part? Its on sale for............ Are you ready??? $40! And this limited edition colaboration is faux leather, not real leather. But it comes in SILVER hardware!! Not gold!!!!! I am a happy blogger tonight!